Many experts and investigations have found little conclusive proof that the Blue Whale game exists. In the last few weeks, a number of teen suicides in India have been linked to the Blue Whale game. The online phenomenon has caused reasonable alarm among parents and the authorities alike. It has even prompted the Indian government to write to Facebook, Twitter, Google and other platforms to take down all links related to the Blue Whale challenge. However, here is the catch – many say that the suicide game doesn’t even exist. At a recent conference on cyber security in Kochi, Inspector General of Police (IGP) and the nodal officer of Cyberdome, Manoj Abraham claimed that the Blue Whale Challenge did not exist. Speaking to the media at 'c0c0n X - 2017', Manoj said that all the signs otherwise associated with the Blue Whale game are actually signs of depression and suicidal tendencies, and that there was no such challenge. Manoj is not the first one to debunk the existence of this sinister online phenomenon. Internet hoax busting website Snopes had reported similarly earlier in February. Dan Evon wrote for Snopes that the existence of the Blue Whale game was based on a misinterpretation of an investigative piece in Russian publication, Novaya Gazeta, published in May 2016. The article linked dozens of teen suicides during a six-month span to a group on Russian social media platform VKontakte. At least 80 of the 130 people who committed suicide between November 2015 to April 2016 were part of this group and their suicides, the publication claimed, was linked to the Blue Whale game. However, Snopes refers to an investigation by Radio Free Europe which found that there was no conclusive evidence that these teenagers were indeed playing the Blue Whale challenge which ultimately led them to end their lives. Further, while many children who committed suicide were part of this online community on VKontakte, it is difficult to establish that being part of the group led them end their lives. The reason the children were part of this group could have been the opposite as well – it was a group which teens simply joined with others who were also struggling with suicidal thoughts. Snopes reports that while “Blue whale” groups do exist, they originated after Rina Palenkova, a Russian teenager, supposedly took her own life after posting a photograph of herself on VKontakte. Social media communities like “Sea of Whales” and shock video sites circulated Rina’s photos and said that she was part of a suicide group. However, the administrator of Sea of Whales claimed that many groups were using Rina's suicide to drive traffic to their page. So when he created his own whales, it wasn't to push them to commit suicide but apparently, to help suicidal teens by “becoming one of them”. 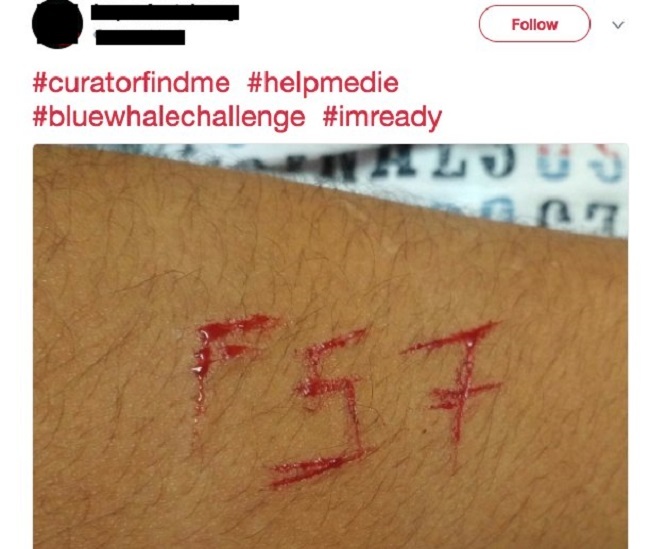 Phillip Budeikin, an alleged Blue Whale administrator and creator of the F57 group who was arrested in May was associated with at least 15 Blue Whale suicides. He said in an interview to saint-petersburg.ru that while admitted to pushing the teens in his group to commit suicide, he merely “communicated with them” and they later ended their lives “without his direct influence”. The Blue Whale game is reported to have originated from Russia through VKontakte. It apparently comprises of 50 tasks, which include self-harm, depriving the child of sleep, and support, isolating them, and ultimately making them commit suicide. Pranesh Prakash, Policy Director at the Centre for Internet and Society, says that in no case related to the Blue Whale game has he come across conclusive proof which proves causation. “For instance, one would expect to see communications from a person urging the child or the teen to engage in specific tasks. However, forensic analyses of mobile phones have not revealed any such messages,” he tells TNM. Others have also failed in finding a concrete connection between the game and teen suicides. For instance, Alexandra Simon-Lewis for Wired reported in May about the fear among UK citizens about the Blue Whale game’s arrival to their country. However, the UK Safer Internet Centre had failed to corroborate the threats of the such a suicide game, despite parents and police departments expressing concern. Earlier in March, Georgi Apostolov of Bulgaria’s Safer Internet Centre had told Anne for NetFamilyNews.org that the Blue Whale game was a just “manipulation” but one which affect parents and vulnerable children. Apoplstov said that they had had several cases reported to their helpline where children with self-harming and suicidal tendencies were using the manipulation as an excuse to not talk about their “real problems” aka mental health. Experts have also reported how the lack of digital literacy, fuelled by media sensationalism creates unjustifiable panic and can even make something non-existent, real. He also makes the case against moral panic about the internet as a whole which would end up undermining freedom of information. This knee-jerk reaction of restricting access rather than dealing with the problem finds expression in the way authorities handled the case of a New Delhi teen, who apparently tweeted that he wanted to play the Blue Whale game and a curator should get in touch with him. 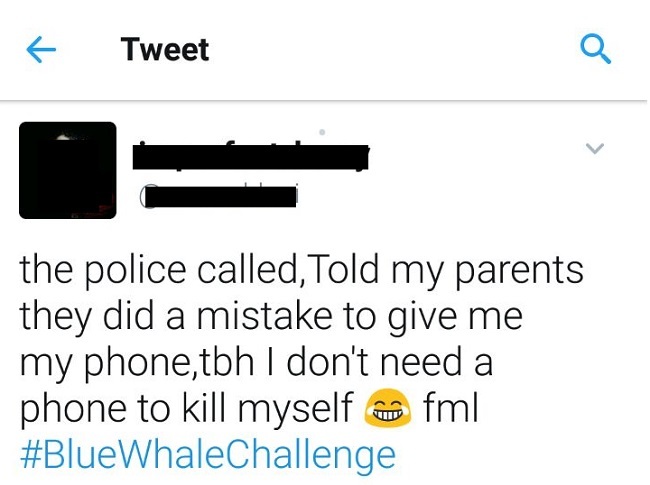 He tweeted later that the police called his parents and said that it was a mistake to give him a mobile phone. More troubling, however, was his next statement, “I don’t need a phone to kill myself.” Both these tweets have been deleted now. If the Blue Whale game is indeed a hoax, the fact remains that it has created an international buzz. This in turn may have ensured that it becomes real, even if it were not in the first place. Nechama Brodie - the head of Tri-Fact training and research at Africa Check, pointed out to Gia Nicolaides for Eyewitness News that while some viral stories may originate from someone’s imagination, but they don’t remain so. “[They] become real over time because we've invested so much interest in them. So, it didn't exist before but not it exists as a concept," Nechama said. Dr Sameer Hinduja, professor of criminology and criminal justice at Florida Atlantic University told the same thing to Fiona Gartland of Irish Times in May. He said that because we had made something real even if it wasn’t because of our reaction and now, someone might decide to take their life because of it. Whether the Blue Whale game is real or not, the underlying and more pertinent issue remains teen mental health. “Such sensationalism by the mass media leads to misdiagnosis of the problem. Instead of taking action on appointing counsellors in schools and educating teachers, parents, and children and teens about depression, bullying, etc., central and state governments have sought to get this non-existent "game" banned instead,” argues Pranesh.